We started off the New year by landing some work in a funky beach bar/restaurant in Ko Lanta for over four weeks. We lived on-site, 10 steps to the beach, it was great to be involved in running a business out here - regular trips to local markets for supplies with Egk, we introduced Premier League footie nights - mainly for Brad's benefit but we got some extra customers in! The girls spent late nights hunting for hermit crabs on the beach as Louis had a bit of an obsession for them whilst the boys supposedly cleared up! We were really sad to leave! We then headed overland to Northern Thailand to the towns of Petchaburi, Ratchaburi and Kanchanaburi, a lazy town on the River Kwai with numerous war cemeterys and museums and of course the famous Bridge! The island of Ko Samet National Marine Park was our next stop over, a weekend getaway for Thais. There were no roads just sandy tracks - cool though as the only way to get around was on dirt bikes! We crossed the border to Cambodia for a month, we used one of the lesser used crossing at Ban Pakard, you could see why - it felt like no-mans land! Then through to PAILIN - a small town, where retired Khmer Rouge leaders live amongst the locals - a strange situation! It's one of the most heavily mined areas in SE Asia, you're advised not to go off the marked paths - sadly throughout the country you become very aware of this as many amputies sell books to tourists to get by. We drove along the bumpiest road ever, just sand and rocks for four hours through some rural villages - where horse and cart was the only transport. We could barely see what was ahead because of the 'Cambodian snow' (sand storm). We then headed towards the river town of BATTAMBANG, home of the best beef Loc Lak in Cambodia and one of the filthiest rooms we've stayed in ever, minging! Then along to SIEM REAP - with a buzzing nightlife, smart restaurants and 8k away from the UNESCO World Heritage Site - The Temples of Angkor. We hired bicycles to explore some of the 1,003 temples - they were an amazing sight, but we were bloody knackered - covering 27k each day in 36 degree heat!! - the white bicycle project helps support local children so well worth it, but we def needed an ice cold Angkor beer after! We then hung out in the capital PHENM PENH, home to the Killing Fields of Choeung Ek and the S21 Prison in Tuol Sleng, where thousands perished under the Pol Pot regime. It was very quiet and eery to know that many of the mass graves are still to be unearthed. It was very moving and we were pretty sombre for a while after. PP is a bustling city with Khmer food stalls on every corner, packed with locals drinking khmer tea and a pile of noodles and the best veggie cakes for only 3,000 riel = 40p - so we noshed it up a bit there! We then headed to the coastal town of SIHNOUKVILLE, it has a cool vibe and a younger crowd. With satelite chairs on the beaches, hanging chairs in the shade and a vibrant nightlife on the sands. We enjoyed a messy Paddy's Day, sadly no Guinness in sight but we both had the famous Cambodian Happy Herb pizza which brought a smile to our face and made some good friends. 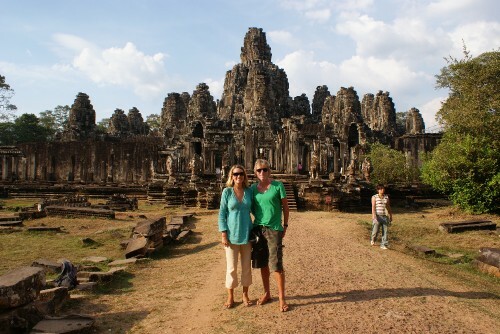 We've really enjoyed Cambodia and would recommend it to anyone, especially if you have enough time to really explore. Love to everyone, the next time we write we'll have some of you guys in the snaps!